Tess L. Bracken is a freshman at Dartmouth College, playing Division I Women’s Hockey for the Big Green. She is from Winnipeg, MB, where she played prep hockey for the Balmoral Hall Blazers of Balmoral Hall School. Tess is considering majoring in Neuroscience and a possible career in medicine after she graduates. Ask someone in North America if they know who Sidney Crosby is, and the majority will say yes. Ask someone in North America if they know who Hilary Knight is, and although some people will, the amount of ‘yes’ answers will be miniscule compared to Crosby. This gap in knowledge parallels the gap between these two professional hockey player’s salaries. This gap needs to be eliminated, and the only possible move is a much-needed merger of the CWHL and NWHL, the two professional women’s hockey leagues in North America. Hilary Knight, an Olympian and the highest paid professional women’s hockey player, who has practiced with the Anaheim Ducks, will get paid $25,000 this season.1 Her male counterpart, Sidney Crosby, will make $16.5 million this season,1 which is 660 times more than Knight. If you thought this was bad, Marie-Philip Poulin, a Canadian Olympic hero, along with every other player in the CWHL, will not make any money from her team this season. In fact, she may have to pay up to $1,5002 to provide herself with equipment. To put these numbers into perspective, each NWHL team is allotted $270,0001 to pay their players, the CWHL has $0, and NHL teams’ salary caps can reach up to $75 million.1 “Aside from the ingrained bias against women’s sports, there is no real reason why women’s hockey should be so overlooked while the most popular NHL teams are worth more than a billion dollars apiece.”1 This blatantly obvious financial inequality between the two sides needs to be eliminated, hence, the merger. 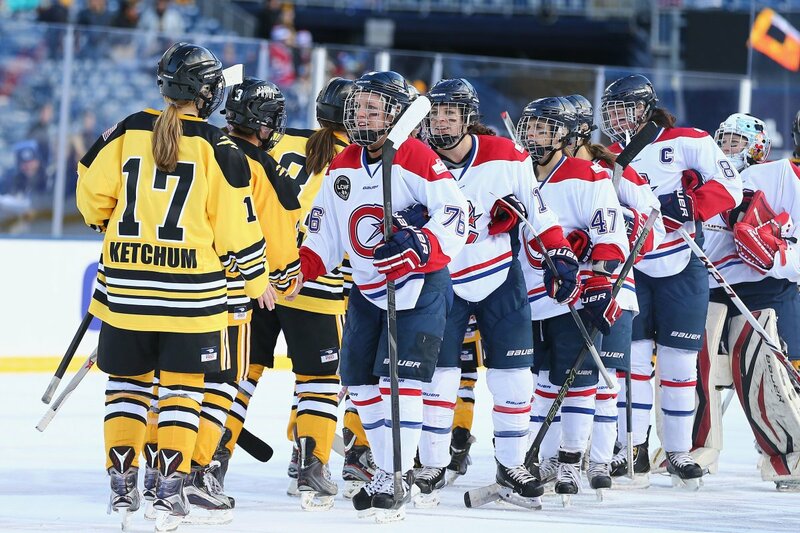 A merger has so many positive possibilities for the potential of women’s professional hockey. The benefits for both the CWHL and NWHL are so clear, it’s hard to believe this merger hasn’t already been put into action. The CWHL, the more established of the two, taking part in its eighth season, has partnerships with select NHL counterparts. These include; the Montreal Canadiens, Toronto Maple Leafs, and Calgary Flames. The partnerships have “involved resource sharing of various degrees as well as monetary investments and assistance with equipment.”3 The NWHL, currently in its first season, obviously has not had the time to create these relationships, which is where the benefit of a merger comes in. The CWHL could benefit from the merger in a big way, in that they could pay their players. The NWHL starting up caused the CWHL to lose a lot of players, because who wouldn’t want to get paid to play the sport they love? The NWHL has the benefit of a major sponsorship with Dunkin’ Donuts, so by merging, the CWHL would have an equal influence on their players by gaining the ability to offer them a salary. Having a division between the only two professional women’s hockey leagues, also puts the NHL in an uncomfortable position when deciding which, if any, league it will support publicly. As stated by Beth Boyle Machlan and Kaitlin S. Cimini in their article “A Winter Classic Debacle and the Future of Women’s Pro Hockey,”4 “while the women’s game will benefit from NHL support – and all its accompanying advertising – it is almost certain that the NHL would rather support one league, not two competing entities.” By merging, women’s hockey would be highly likely to receive support and exposure form the NHL, which is what the sport is currently lacking. Tons of people all over North America follow the NHL – together as a continent, rather than Canada vs. the United States, as women’s hockey is currently divided. To be specific, the NHL’s Winter Classic this year, in 2016, had 2.8 million viewers, which although seems like a large number, was 20% lower than the previous year.5 The inaugural Women’s Winter Classic took place in 2016, and there was absolutely no coverage of the game. It took place the same day as the NHL Winter Classic, where cameras were set up all day covering practices and an alumni game. The NHL is “claiming that for whatever reason they didn’t have the facilities in place to broadcast any kind of live coverage of the women’s game – despite previously showing live PRACTICES from the men in the hours before and broadcasting the alumni game live with the full broadcast treatment immediately afterward.”5. Clearly, there is potential to expose women’s hockey, but a merger needs to happen in order to gain the support and resources of the NHL. By exposing women’s hockey to this large audience, as a North American league, it is guaranteed to spark a conversation. Women’s professional hockey is a subject that far too many people are uneducated on. A conversation generated by none other than the NHL is guaranteed to, at the very least, cause curiosity, which in turn will develop knowledge. So far, in the history of women’s hockey as a whole, it has been viewed as inferior, all due to lack of education of the public. Very few people acknowledge how hard female professional hockey players are required to work outside of playing their sport. As an NHL player, hockey is their job. As a CWHL player, or even an NWHL player, these women must have a fully supportive career, while balancing the time commitment of playing a professional sport. These women have trained their entire lives, just like any NHL player has, to get where they are today. This is a fact that many either ignore, or are unaware of. By bringing two nations together and exposing these facts, the potential of women’s professional hockey is endless. Creating a knowledge and understanding among the public would bring communities together to support these women, building larger fan bases. Many people are highly unaware of the level of ability these women possess. Intriguing people causes them to watch the games, which would enlighten many people about how impressive the women’s game actually is. Fans would come back to watch more games, and larger fan bases are a huge key in moving professional women’s hockey forward. They bring heightened exposure, support and the financial push the sport needs.